Due to the snow situation in the Catskill Mountains we have postponed out visit to Dai Bosatsu Zendo. The access road to the center is currently only passable by snow cat. We will reschedule the excursion within the upcoming months when the access is easier. Please stay tuned! Charles River Zen (CRZ) invites you to join us in a weekend of practice with our Rinzai Zen Dharma cousins in the Catskill mountains. Rinzai-ji and the Zen Studies Society (ZSS) trace their lineages back to Gasan Jito (1727–1797), a dharma heir of Hakuin Ekaku Zenji (1685-1756). Gasan had two successors, Inzan Ien (1751-1814) and Takuju Kosen (1760-1833). CRZ’s dharma lineage follows the Inzan branch, while the ZSS lineage is traced back to Takuju Kosen. Dai Bosatsu Zendo Kongo-ji is a residential facility dedicated to formal Rinzai Zen training. For the opening ceremony on July 4, 1976, both Joshu Sasaki Roshi and Genro Seiun Osho were present, along with the founder Eido Roshi and many other Buddhist teachers. The Abbot of DBZ, Kongo-ji is Shinge Roshi, who has offered to give a talk during the weekend. The program will include morning and evening zazen (meditation), chanting, communal meals, and samu (work practice). Accommodations are dormitory style, rooms are shared with same gender participants. There will be a full formal schedule in which all visitors are expected to participate. February in the mountains calls for appropriate clothing, including long underwear. Practice robes are required and DBZ will lend robes to those who do not have their own set. While there is heat in the buildings, the temperature is lower than commonly expected (55-60). Some outside work may also be assigned and everyone should bring appropriate winter gear. The group will carpool – the ride is about five hours each way. We plan to leave between 12 pm and 1 pm on Friday, February 21, 2014 and leave DBZ in the early Sunday afternoon. The total cost is $175 and a $100 deposit is required to secure a space in the carpool. Please respond as soon as possible to allow us to arrange for the appropriate transportation. Should the weather conditions interfere with safe travel or cut off accessibility to Kongo-ji, we will postpone the excursion and refund the deposits. Please contact us through the contact form or call 617.800.9585 with any questions you may have. Time flies – just as it is said in the Last Admonition by the National Teacher Kozen Daito: 光陰箭の如し(ko in ya no goto shi) “time flies like an arrow”. We have found our new home on Spring Street to be a nice and welcoming place. The spacious room with the wood floor leaves plenty of space for newcomers to add to the line of cushions that are occupied by the steadfast members of the sangha. We have the great pleasure to welcome Patrick from Vienna, who moved to the Boston area to take up teaching at one of the local universities. Patrick has trained at Mt. Baldy Zen Center and Rinzai-ji in California and also spent some time in Montreal. Welcome Patrick, we are so glad to have you here! On October 16 Dokuro participated as a Harvard Chaplain in the twice annual Silent Vigil for Peace. Three hours of seated meditation in front of the Science Center, sitting with fellow chaplains from a variety of traditions and with students who joined – quite an experience. The bustle of a vibrant and busy university campus, streams of students, faculty, staff, and visitors… flowing effortlessly around the vigil. For November 13 we have planned a public talk “What is Zen” – please mark the date and invite anyone who you think may be interested! On July 21 the new Business Abbot at Rinzai-ji was installed, Hoju Eshin, Osho. On October 18, 2013, Sasaki Roshi has officially retired from direct teaching of students and disciples. Joshu Roshi’s advanced age has kept him de facto from direct teaching since early 2012 but his retirement makes this step official. Our sangha will continue to practice and is looking at more opportunities to “manifest into the ten directions” while keeping the core of Rinzai Zen practice vibrant and alive. The leadership and the long time practitioners are continuing to attend retreats, give retreats, and set up these opportunities locally as well. Rinzai-ji is finding its way after the retirement of Sasaki Roshi, and the community is in the process of maturation. The analogy of the stone tumbler comes to mind: all sangha members are thrown into this process, tossed around, tumbled, but with the continued movement and development sharp edges will disappear and some polished outcome emerge. Patience, compassion, and willingness for change and forbearance are needed. Earlier this year Dokuro participated in a sesshin at Dai Bosatsu International Zendo, in the Catskill mountains, where our “cousins” in the Rinzai tradition practice. There are two major lineages after Hakuin Ekaku 白隠 慧鶴 (1686-1768), who is a common ancestor in all living Japanese Rinzai lineages. At the bifurcation stand the notable masters Inzan Ien 隱山惟琰 (1751–1814) and Takujū Kosen 卓洲胡僊 (1760–1833). Sasaki Roshi’s lineage traces back to Inzan, Eido Roshi’s ancestry is from the Takuju lineage. 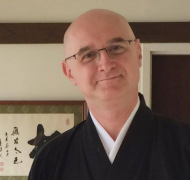 The opportunities to train and experience Rinzai Zen in America are rare, and both the disciples of Joshu Roshi and Eido Roshi are continuing to pass the practice and heart of Rinzai Zen into the future. Please come and join Charles River Zen, bring someone who is interested, or make them aware that there is a place to practice. We will receive anyone willing to join the communal practice with open mind, open heart, and open arms.